As we wrap up our 30 Days of Recipes this month (check it out on our Facebook page here), I wanted to delve into my secret/ not-so-secret love for eating out! Ottawa is an amazing city to eat out, no matter what type of food you prefer. There is loads of diversity and every pocket of the city has a unique flare of culinary wonder. Eating out can often lead to bad health choices… especially when there is desert involved! Fortunately, our city is progressively moving toward more and more “Health-Conscious” eateries- places that serve local, organic, non-GMO, high quality meals. Without further adieu, here is our list of Ottawa’s Healthiest Restaurants. Vegan/vegetarian restaurant with multiple locations that values great quality, presentation, and gives very hearty sized portions! You will not leave here hungry, that’s for sure! Try their smoothies and juices too for an added health bonus. I highly recommend their Cauliflower Wings. For an on-the-go meal, Freshii is the place to be! They have really creative options for wraps, salads, bowls, soups, and you can even build your own creation to make exactly as you like. A personal favourite is the Bamboo Bowl with rice noodles instead of brown rice. Founded by the creator of David’s Tea, this new trendy cafeteria-style restaurant promises to create crave-worthy healthy food for people on the go. Most of their options are designed as vegetarian with the option to add in a protein. This restaurant also prides themselves on being “cashless”- they only accept debit and credit, so make sure you have your card handy! If you are looking for extraordinary customer service and award winning food, this is the place for you! Wellington Gastropub specializes in beautifully crafted dishes made with the best quality ingredients. They are always very accommodating for any allergies or food preferences. Not to mention their desserts are mouthwatering. With a menu that changes daily, you will never get bored. Breakfast done right. While the line up on weekends may be long, it’s worth the wait. The breakfast quality at Chesterfield’s transports you to your grandma’s kitchen, it’s just that good. Everything is made to order, so you are getting the freshest ingredients that are locally sourced. This juice bar is the talk of the town with it’s plant-based foods and juices. The ingredients are the freshest of fresh, and the atmosphere is fun and upbeat. Try the Thai Bowl, you won’t regret it. This unique vegetarian/vegan restaurant is unique in that it’s a pay-by-weight buffet. Their selections change daily with many options to choose from. If you are looking for great quality in record time, the Table will be your new favourite place. This trendy coffee shop is on the rise with Ottawa’s hipster scene, and for good reason. Their coffee and espresso are unbeatable. Try their Americano and you will never go elsewhere. The Hintonburg location also serves fun local beers and wines in the evening! 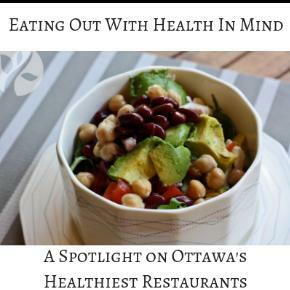 What are your favourite healthy eateries in Ottawa? We are always looking for more favourites to add to our growing list!